Far too often, the younger generation get a bad rep. We’re far too quick to dismiss them as selfie-mad who only care about themselves. Heck, I’ve been guilty of it myself. But there are so many children and young adults who are already making a huge positive difference in the world, and we should shine the light on them whenever we can. One such youngster is Lulu Cerone. When Lulu was growing up, her family had a lemon tree in their backyard. So, naturally, she set up lots of lemonade stands.At first, she and her friends would use the money to buy little pleasures, like toys or candy. But when Lulu turned seven, she decided to do something more significant. Instead of spending their lemonade money, Lulu and her friends gave it to a local dog shelter, which upped the ante on their simple pastime in a big way. “We realized that adding an element of social good to this social activity not only helped some dogs, it made it way more fun and meaningful,” writes Lulu in an email. A very nice gesture, I’m sure you’ll agree – but that was just the beginning. Soon after, Lulu started researching other causes and stumbled upon Blood:Water — a nonprofit that seeks to end the HIV/AIDS and water crises in Africa. On their website, she learned that $1 can provide one person in Africa with clean water for an entire year. “It never occurred to me that people didn’t have access to water — a basic human need I totally took for granted,” Lulu writes. So Lulu’s lemonade stand profits started going toward providing clean water to people in Africa. Then, in 2010, the philanthropic game changed again. When Haiti was struck by a devastating earthquake, Lulu and her friends decided to throw down a boys-versus-girls fundraising competition for Lulu’s entire fifth-grade class. The idea was such a hit that it spread to neighboring schools, and before they knew it, they were getting donations from all over the city, raising a total of $4,000. The experience made Lulu and her friends realize just how much difference their projects could make to the lives of thos eless fortunate. And just like that, her nonprofit organisation, LemonAID Warriors, was born. LemonAID Warriors provides teens and young adults with the tools they need to make a difference, wherever they are in the world. Obviously, there is no shortage of worthy causes that need help, and LemonAID are constantly offering new and exciting ways to lend a hand. 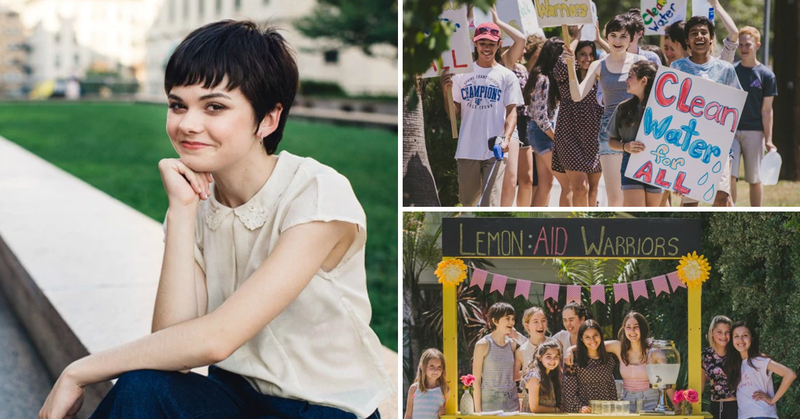 What started out as a lemonade stand has grown into a wildly successful nonprofit that’s raised over $150,000 for people in need- and Lulu is at the center of it all. At age 13, she was sharing social good action plans with the heads of Mattel. Soon after, she flew to Uganda to visit some of the water projects the Warriors helped fund. At 15, she won a Nickelodeon Halo Award and wrote her first book, “PhilanthroParties! A Party-Planning Guide for Kids Who Want to Give Back.” Now, at 18, she’s one of L’Oreal Paris’ Women of Worth honorees. These are incredible achievements for someone so young. Lulu has now turned 18, meaning that is legally an adult – lord knows what we can expect to see from her in the years to come! So what message can her peers take away from this? Well, it all starts with with small actions, that snowball into real change. This is how Lulu got to be where she is today. Lulu also suggests looking into getting a mentor to guide you. In fact, Lulu now has her own mentee, 14 year-old Madi Stein, who is now the president of LemonAID Warriors. People like Lulu showcase Generation Z at its best – a group of creators and visionaries with a social conscience, who are willing to do whatever it takes to make a change. I, for one salute them!